A chemist in the College of Arts and Sciences has received a major grant to study the synthesis of stainless nanoparticles. 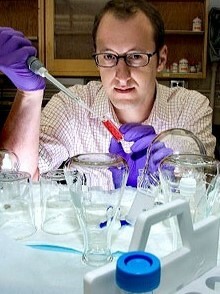 Mathew M. Maye, associate professor of chemistry, has been awarded a three-year, $360,000 grant from the National Science Foundation (NSF). The award supports his ongoing work with metal stainless alloy nanostructures, the results of which may impact gas storage, heterogeneous catalysis and rechargeable lithium-ion batteries. Maye’s approach is novel, in that he is attempting to chemically synthesize nanoparticle alloys that resemble steel and stainless steel. An alloy is a mixture of metals whose properties are different from those of its individual elements. When carbon is added to iron, the result is steel that is strong and hard. Mix in chromium and nickel, and the steel becomes stainless, or rust-proof. Maye’s work utilizes nanoparticles that contain iron cores and thin shells, the latter of which are made up of chromium, nickel, aluminum or titanium. He has developed the chemistry to produce these materials, which are then exposed to heat and oxygen, allowing for control of alloying and oxidation. Maye says that, like any good project, the new materials’ properties were discovered by taking a novel approach. Maye says the goal of the NSF project is three-fold: to develop “wet-chemical” synthesis strategies to prepare the alloy nanomaterials; to understand their oxidation and phase behavior; and to use such behavior to construct novel structures. In addition to underwriting research, the NSF grant will serve a broader impact by supporting an annual workshop that brings together regional leaders in nanoscience. The first such “Upstate Nano” workshop will take place next summer at Syracuse University.